Last Tuesday we headed off on a 4hr journey to Hartpury in Gloucestershire for the British Dressage National Winter Championships. Herbie and I had qualified in the Elementary Petplan and Novice Music, with the Elementary test in the outdoor arena on the first day and the music in the main arena on the second day. The Elementary went really well, Herbie was very rideable and produced two lovely tests (there were two rounds to the competition) and we ended up 6th out of a field of 60. I was thrilled with this result at our first ever Dressage Champs. The second day was our music. On the morning of the class the names of the competitors was published and with 23 in the class, just two of us were marked as amateurs so I knew I would have my work cut out! 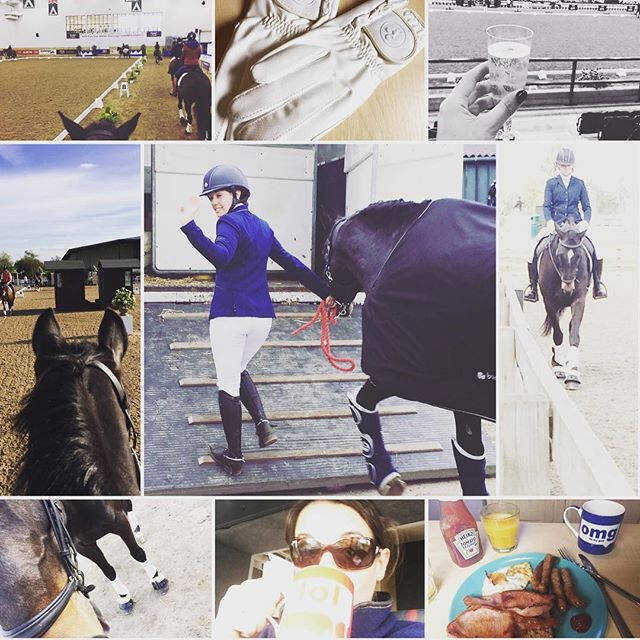 We had the opportunity to take our horses into he main arena at 6.30am to walk them round (where Charlotte Dujardin was also doing her arena walk! ), this was really helpful although none of the trade stands were open and the atmosphere was very different to what we would find later that afternoon!! I was worried Herbie would be a bit quiet after two tests the previous day but he came out full of it!! He was quite fresh in the warm up but we know each other inside out and when we headed down to the main arena he settled down and put his work head on. He produced a beautiful test, probably our best to date and he stayed with me all the way. The lady who bred him and sold him to us 5 years ago came to watch so it was quite an emotional day all in all! The music went really well and it was so much fun riding to The Beautiful South, knowing I'd spent hours tweaking it at home! We ended up 12th and with the calibre of people in our class I was thrilled with the result. The experience was fantastic and I was so proud of what we achieved, mum plays such a critical part in it all and we make a great team and have a lot of fun along the way! Thank you to Caldene for letting me take over the Instagram page on Thursday, we had a ball reporting live from the main event!